A lot of times when people add a new chinchilla or two to their family, they have a huge shopping list of supplies and accessories to get. 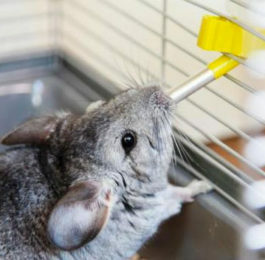 In addition to a nice big chinchilla cage, accessories, and healthy food you need to be prepared for some “worst case scenarios,” like if your pet chinchilla gets sick or injured. Just like you have a first aid kit in your home for your human family members, you want to have supplies on hand for your furry family members as well. That is why a chinchilla first aid kit is an essential “supply” to have on hand. While you may think your chinchilla is young and healthy and won’t have any health problems, you never know when there will be an emergency situation. And in my experience, these emergencies–big or small–always seem to happen late at night or on the weekends when the vet is closed or it’s hard to get to a store to buy supplies. Having a chinchilla first aid kit on hand means you will have what you need when your pet is sick or hurt and can make a difference between life and death in some situations. And if there is some sort of emergency or disaster where you have to evacuate your home, you’ll be really glad you put together a kit you can grab and go. 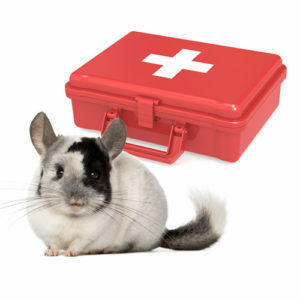 This article has everything you need to put together your own DIY chinchilla first aid. If you don’t want to go through the work of gathering all of the elements separately, you can buy a Chinchilla Home Emergency Kit from Iki Kolohe on Etsy or Amazon. Note: This kit is to help you prepare for minor emergencies and illnesses. If you’re currently experiencing an emergency with your chinchilla, go to the vet now! If you’re putting together your own chinchilla first aid kit, the following is alist of supplies your should have on hand. Many of the items are common first aid items that you may already have around your home or can be easily purchased at a pharmacy. For the items that are a little more difficult to find, we’ve included links to Amazon where you can buy them. Since some of the food and medication items will have expiration dates, make sure you are regularly replacing them. All of the supplies for your kit should be stored together in a watertight container like a plastic box. This will make it easier if there is an emergency where you need to evacuation so you can just grab the kit and go. You can use any container you already own or purchase one like the first aid box pictured to the right. Once you have your box, fill it with the following essential items. Vet Contact Info – If you have a business card for your exotics vet, include that in the kit or write their contact information on a piece of paper. Include info for an emergency vet or other emergency resources (like a chinchilla rescue) that you may want to contact in case of a medical emergency. Vet Bandaging Tape (Buy on Amazon) – Self-sticking bandage tap frequently used by vets. Does not stick to fur or skin. Oral Syringes – For administering medicine, Critical Care, and fluids. 35 cc is best for feeding and a smaller size is good for medicine. Pedialyte – Good for dehyrdrated chins and constipation. Fruit flavors like apple are most liked by chinchillas. Oxbow Critical Care (Buy on Amazon) – This food replacement is meant for hand feeding chinchillas who refuse to eat. It’s mixed with water and fed through a syring. Can be bought online or at your vet. Simethicone Infant Drops (Buy on Amazon) – These gentle gas drops are good for bloat or gas, helping to break up gas in your chin’s tummy. Fresh Pineapple Juice – Pineapple has natural enzymes that break-up intestinal blockages. It has to be fresh because processing destroys the enzymes. The besy way to store it is to get a ripe pinepple from the store and free the juice from it. When your chinchilla needs it, you can thaw the juice and feed with a syringe. Eye Wash – To flush dirt or debris from their eyes. Find a solution that does not have saline, because it can be irritating. 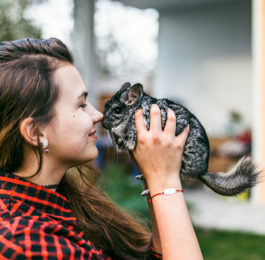 Vasline – to reove hair rings in male chinchillas. Betadine (Buy on Amazon) – To flush wounds. Dilute to 10% betadine and 90% water. Acidophilus Tablets (Buy on Amazon) – Balances bacteria in the stomach to avoid intestinal upset while taking antibiotics. Keep refrigerated. Styptic Powder or Cornstarch (Buy on Amazon) – To stop bleeding of minor cuts. Ice Pack or Marble Tile – To help keep your chinchilla cool or cool down an overheated chin. Keep a marble tile in the refrigerator so it’s ready whenever you need it. (Learn more about keeping chinchillas cool. For the ice pack, use one you fill with ice, not the ones with toxic gel inside. Towel or Fleece Fabric For restraining chinchillas while giving medications or to line their carrier during transportation. 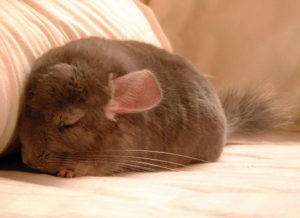 Heating Pad or Hot Water Bottle – To keep sick chinchillas warm. Wrap in fleece or place under cage. Unscented Wet Wipes (Buy on Amazon) – To clean fur dirtied with medicine, food, or excrement. Bag Balm (Buy on Amazon) – Treats sore or chapped skin. Blu-Kote (Buy on Amazon) – Anticeptic and fungicidal perfect to dress wounds and treat infections. If you don’t already have a chinchilla carrier buy one ASAP so you can easily transport your chin to the vet in an emergency. When Should a Chinchilla Go to the Vet? Many chinchilla owners and breeders agree that chinchillas should have yearly check-ups with an exotics vet. At the same time, many chinchilla owners do not take their pets in for annual check-ups. The reasoning behind this is because a vet trip is a very stressful experience for a chinchilla and they will immediately go into “prey” mode. Their behavior will change and they will try to hide anything that’s wrong with them. If your chinchilla has a personality where they get very stressed in new situations, it may be detrimental to expose them to that extra stress if they are healthy. However, if you have a chinchilla that has health problems, they should have regular check-ups no matter how skittish they are. It’s also good to have an initial check-up with a new vet to help them become familiar with the doctor and get used to the process. Since chinchillas are prey animals they are very good at hiding sickness or injury. Because of this, whenever you see any change in personality, behavior, appetite, or poops, you should take them to a vet as soon as is reasonably possible. In an emergency with a lethargic chinchilla or a physically injured chinchilla, go to an emergency vet ASAP. Do not wait as it could be a life or death situation. To prepare for the worst case, you should know the location and contact info for an exotics vet and the nearest emergency vet. Include this information in your chinchilla first aid kit so you have it in the case of an emergency. A good relationship with an exotics vet that specializes in chinchillas should be established before an emergency. They will be an invaluable source of information if you have questions about your chin’s behavior or symptoms and the first place you’ll call when your chin needs medical attention. How to Find a Veterinarian for a Chinchilla? Unfortunately, because chinchillas are an exotic pet, not every veterinarian is capable of treating them. Some vets will say they treat chinchillas, but they may not have the knowledge or training necessary to care for these special pets. You should do your research before selecting a vet. The first resource I would recommend is to talk to your chinchilla breeder and see what vet they recommend. If you did not get your chinchilla from a breeder, search Google to see if there are any chinchilla breeders in your area. They may have vet recommendations listed on their website or you can call or email them for the info. If there are no breeders near you, Chinchilla Club has a vet directory you can use. When you select a new veterinarian or animal hospital, make sure to ask them questions about what training they’ve had (they should be exotic certified) and how often they treat chinchillas. Forever Feist Chinchilla has a great list of qualities to look for in a chinchilla vet. Learn about safe wood and materials for chinchilla toys and accessories. Discover healthy chinchilla food and diet. Find out how to clean a chinchilla cage.